Amazon has released Lumberyard, a new free AAA game engine. The engine, which is “deeply integrated” with Twitch and Amazon Web Services, is particularly intended for creating multiplayer online games. Lumberyard, which is capable of deploying to Windows, PlayStation 4 and Xbox One, has pretty much all of the features you’d expect in a modern AAA engine. That isn’t entirely surprising, since it’s based on Crytek’s CryEngine, used on the developer’s own AAA titles, as well as third-party games like Star Citizen. CryEngine itself remains commercially available, although the news seems certain to further diminish its chances of mass adoption by indie artists – a market in which Unity and UE4 have made most of the running. Lumberyard is effectively a fork of Crytek’s code, with Amazon overhauling some of CryEngine’s components, and adding new tools including a new particle editor, a 2D/UI tool, and a cross-platform asset pipeline. It also adds a new networking layer, GridMate, intended to help build high-player-count multiplayer games. 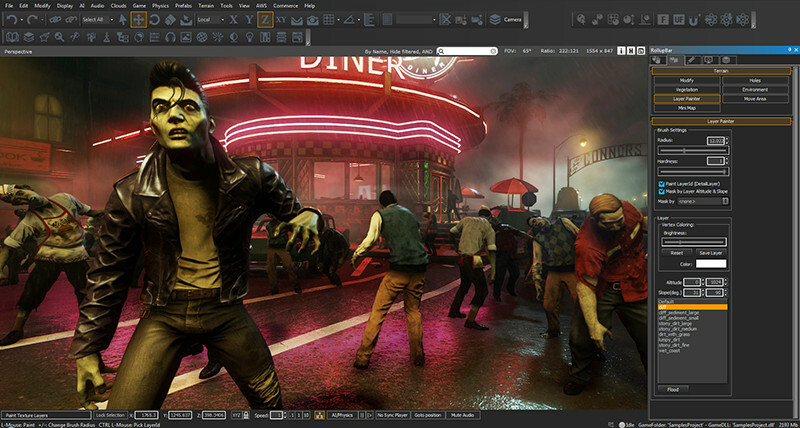 Lumberyard’s editor interface. The new engine is based on the same core technology as Crytek’s CryEngine, but contains new systems intended to help developers create high-player-count multiplayer online games. That last part is significant, since it’s where Amazon hopes to make its money: you can only run Lumberyard games on a local machine, private servers or Amazon’s own AWS services. You can’t host online multiplayer games on any rival cloud platform, which includes anything that competes with GameLift, Amazon’s new service for deploying and scaling multiplayer games. Regardless of your opinion of AWS, a key selling point for Lumberyard looks to be its integration with streaming platform Twitch: an increasingly important promotional outlet for modern games. Lumberyard enables devs to build games that respond to Twitch chat feedback at an engine level, a system it calls ChatPlay; and will enable viewers to join online games alongside Twitch broadcasters as they stream. Even if you only want to create offline games, Lumberyard looks like a serious rival to Unity and Unreal Engine 4, particularly since it lacks the latter’s obligation to pay 5% royalties if a title makes over $3,000 per quarter. While Lumberyard can’t currently deploy to Mac, Linux or mobile platforms, all three are in development, as is support for VR devices.